Every burn is different… some years are better than others. This was one of those years. Eli, Dexter and I crewed with the Neverwas Haul this year. She is a 9-year old Mobile Art Installation that has become synonymous with Steampunk. 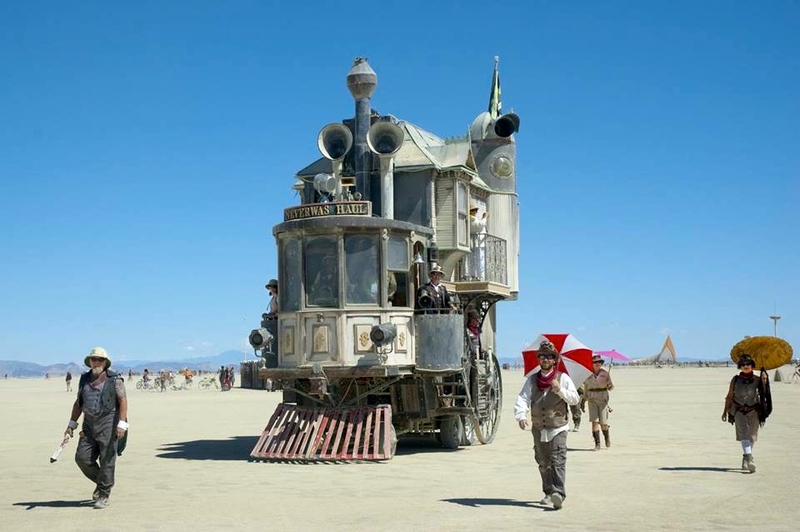 Designed by Shannon O’hare and built by Obtainium Works (now based in Vallejo), the Haul is a self-propelled three-story Victorian house on wheels built from Obtainium (materials that were not bought new but obtained second hand, donated, found or rescued from becoming trash). The Neverwas Haul is truly Steampunk; part Victorian house, part ship and is often mistaken for a train due to the raver rake on the front. Her frame includes walls, doors, windows, staircases, a copper roof and Victorian details. The amazing part is, she is dis assembled for each event she attends. The top two floors come apart and are neatly packed on top. Because she is housed outside year-round, the Haul sustains wear each year. Before each burn, she is taken apart, her parts are re-painted and then re-distressed so she gets a little make over each year. This year the Haul also got new LED lighting and a new hydraulic motor. Did I mention we have an amazing crew of engineers and builders? The Haul is operated like a ship, even piloted with a ship’s wheel. Her working crew consists of a pilot who drives and gives orders to move or stop, a dead-man who controls the kill switch for emergency stops, an engineer in the engine room who communicates with the pilot via a port hole, a port and starboard wing-man who communicate with the pilot and the ground crew, port and starboard walkers who guard the pilot’s blind spots and keeps bikers and pedestrians from getting too close, a point walker who leads the Haul and clears the path of pedestrians and bikers, and a tail gunner who guards the rear from folks trying to jump on. Taking the Haul out is quite a production. The crew take it very seriously. In fact, working crew are not allowed to consume alcohol while on duty which is why the ceremonial Safety Meeting (whiskey or rum shots) after a trip is so valued. However, the Haul’s parlor does house a tiny bar where the riding crew host cocktail service. Eli and I worked mostly as walkers and sometimes wingmen. The pilot assigns positions, making sure that walkers get a rest on return trips. I really enjoyed being on the ground because you get to interact with people, and occasionally beat off a hippie with an umbrella. Dexter often walked with me which was fun for both of us. After I proved my skills (thanks to my experience working Gate) I was often asked to walk point. It was amazing, especially at night during a dust up. 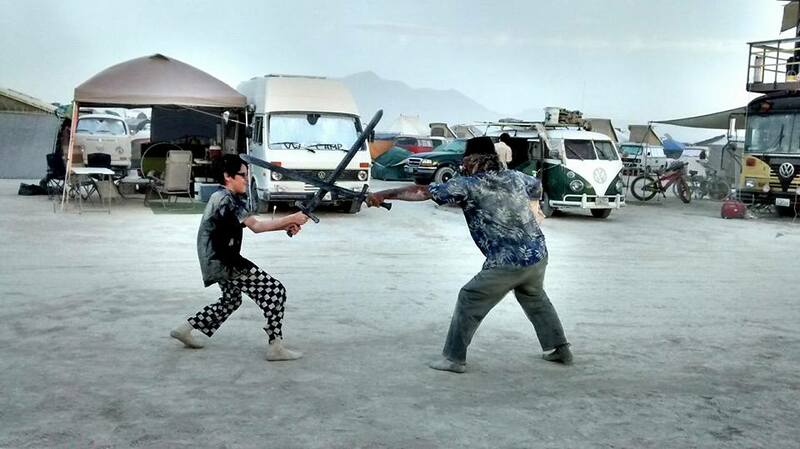 Having a massive house with it’s headlights at your back, following you through an obstacle course of hippies (who often run towards us like we were an ice cream truck), art cars, and piles of fluffy playa… was incredibly grounding. I’ve never felt so connected to the playa environment. Our crew consisted of 25 hard-working adults, plus two kids who contributed with by entertaining us. The crew members are makers, builders, engineers, mechanics, welders, fabricators, artists, designers and heavy lifters… many carry multiple roles. Our fearless leaders Kathy O’hare and Shannon O’hare kept camp and the Haul’s schedule running smoothly, and even let us kids take the Haul out a couple of times on our own. Eli was able to keep up with the crew and truly enjoyed getting to know them all. I often caught him discussing design, mechanics and general geek talk with crew. He fit right in. I regret that I don’t have the same skills, stamina or physical strength of my talented crew mates. I did my best to contribute by fluffing the crew with snacks, drinks and my sewing services. 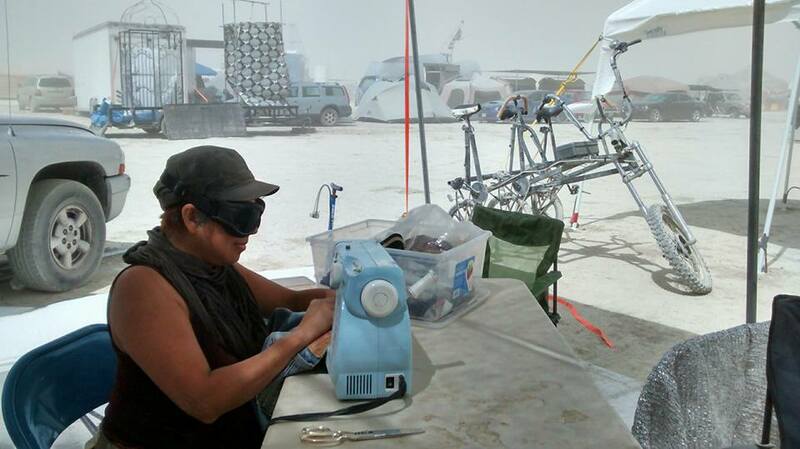 Yes, I brought my sewing machine to the playa. I did do a lot of walking, ignoring the fatigue and pain that my fibromyalgia causes, which caught up with me by the end of the week. Even though I took more rest than most of the crew, I was treated graciously throughout the week. This was Dexter’s 10 burn so it was old hat to him. He entertained and likely corrupted the crew w ith his game, Cards Against Humanity. Since we are now home-schooling, one of his assignments was to create his own playa-version of the game. Dex carried a notebook and jotted down quotes and images around our neighborhood, then together we made the cards. On the night we played his game, the entire crew was in hysterics. Shannon O’hare, a hearty rugged man, even blushed at some of the cards. Eli also gave Dexter a lesson in off-grid power. Dex monitored our solar and generator charged 12V battery, and learned to trouble shoot the system to make sure we had all the power we needed. He even hooked up our ice-make to the solar panel. And it was… all good.